Fill out the form below to download Applerouth's Test Comparison Guide today! 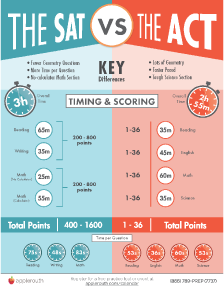 Convert your SAT score to an ACT score and vice versa. Source: ACT, Inc. and the College Board released updated concordance numbers in June 2018. The newest numbers tell students who score above a 1250 on the SAT that their equivalent ACT score is about 1 point higher than was communicated in 2016's tables. Our tutors partner with students, parents and educators to get the best results. See how we can help. Inventive books, flashcards and online lessons help you "get" the content, effectively self-quiz and better recall information on test day.